Nancy has always been interested in sewing, even from her girl scouting years. When she took home economics in high school, she began making her own clothes. 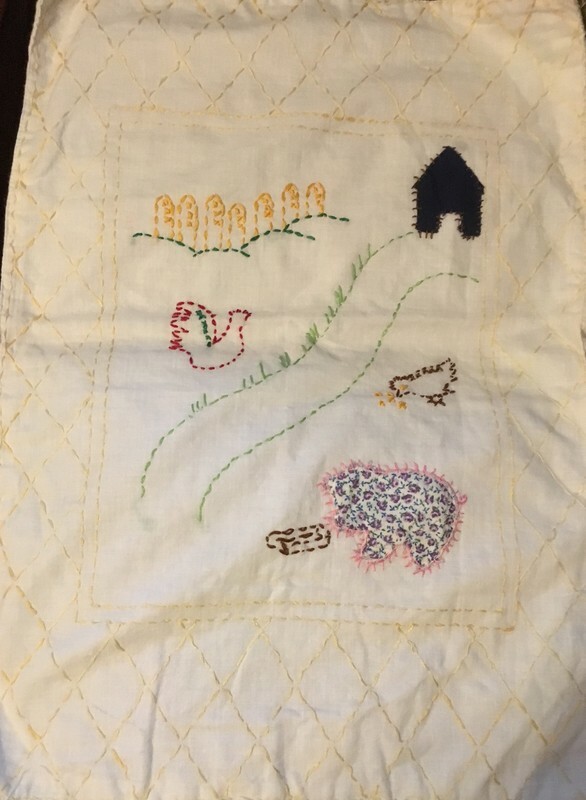 She tells of growing up in Naperville and traveling by train to downtown Chicago to study at Moser Secretarial School and then commuting to work for many years She became very interested in quilting in the 1980s, but didn’t have quilting friends to share her interest at that time. That has changed since she retired in 2011 from the University of Illinois, Chicago campus, where she worked as a medical secretary. 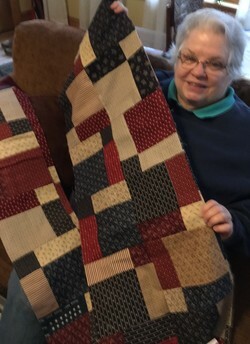 Making quilts for philanthropic purposes is a way of life for Nancy, both through the Artisans group at Community United Methodist Church and quilting with her sister Darlene and their cousins who live nearby. The Ebel Bee they call themselves, devoting their time to making quilts for children’s homes and Quilts of Valor for soldiers. Every September she travels with Darlene and the cousins to North Carolina to participate in quilt camp with more quilt friends where they produce many philanthropy quilts. This March the cousins plan a trip to Pigeon Forge, Tennessee. Exciting new fabrics get Nancy’s juices going when it’s time to plan a new quilt. If she runs into trouble, she calls on long-time friend and guild member Roberta Hollenbeck to help her figure out the problem. She likes having so many talented quilters in the guild, such as Catherine Redford, and viewing so many excellent programs, such as Weeks Ringle’s and Bill Kerr’s presentation earlier this year. She likes machine patchwork and is eager to finish the Disappearing 9-Patch she is currently working on. She hopes to try her hand at applique in the near future. Along with Sue Damitz and Darlene Ebel, she contributes to the guild’s Special Projects.